Prop markets like MVP are always popular around the time of the Super Bowl, and this year is no exception. 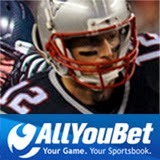 Players from all over the world are flocking to AllYouBet.ag to bet on the MVP market for Super Bowl XLIX, with New England Patriots' Tom Brady the early favorite at +150. Seattle Seahawks players are second and third favorites, despite their side being a one point underdog for the biggest game of the year. Quarterback Russell Wilson can be backed at +225, with Marshawn Lynch at +450. You can earn yourself a $100 free bet for your wagers on Super Bowl XLIX with AllYouBet, which is offering a 50% deposit bonus up to $100 (just use coupon code SBBONUS15). It also has a huge selection of almost 100 different prop markets in addition to the usual pre-match markets for the biggest sporting spectacle of 2015. With the big game just days away, there's just enough time to check out AllYouBet.ag for odds on almost anything you can think of - including the coin toss!